Go ahead, admit it: you’ve always wanted to drive the Batmobile. Just about every iteration of the iconic vehicle has been awesome (we’d give several appendages for a real-life Tumbler), but there’s something unbeatably cool about the original 1966 Batmobile driven by the original on-screen Batman, Adam West. Batman enthusiast Mark Racop is doing his part to give other fans the thrill of a lifetime: owning and driving the Batmobile. 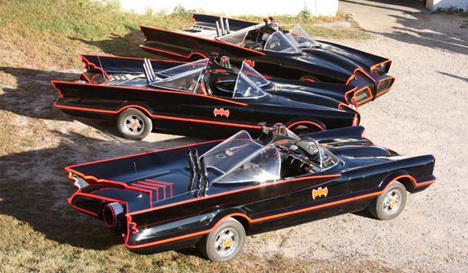 Racop’s Batmobile replicas are modeled off of the original 1966 TV Batmobile and are officially licensed by DC Comics. They come with the distinctive twin bubble windshields, flashing red beacon lights, huge tail fins and – are you sitting down? – working flame throwers in the back. The interior is rich with buttons, dials and switches that are mostly just for show, but add to the authenticity of the creation. With working turn signals, headlights and brake lights, these unbelievably awesome cars are street legal. The Batmobiles are built to order and each takes around six months to make. Racop only makes eight cars a year, and one of his officially licensed replicas will cost you a cool $150,000. But what’s a hundred and fifty Gs when you get to live out every geek’s childhood fantasy of owning one of the world’s most iconic cars? See more in Mods & Custom or under Transportation. October, 2010.